We welcome Rev. Joan Cooper Burnett as our guest Preacher on Sunday April 29, 2018. Reverend Burnett is an ordained minister in the American Baptist Churches, USA. She serves as Protestant Chaplain at York Correctional Institution, a maximum-security prison in the State of Connecticut and the only facility for female offenders, and Niantic Annex a minimum-security prison for men. She is the founder and executive leader of G-GIRLS, Inc. a faith-based non-profit organization formed to foster healthy development and enrich the lives of teen girls and young women. 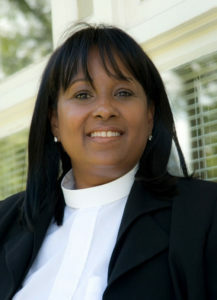 A former corporate executive and business owner, Reverend Burnett suspended her entrepreneurial ventures to answer a call of God to ministry and has since served as Protestant Chaplain at Wesleyan University, Senior Pastor of the First Baptist Church Middletown and the Black Church at Yale. She holds a Masters of Divinity from Yale Divinity School, Masters of Education in Human Resource Education from Boston University, and a Bachelors of Science degree from the University of Tennessee at Martin. Reverend Burnett is the recipient of the Charles S. Mersick Prize for effective public address, especially in preaching from Yale Divinity School and has spoken and facilitated workshops at conferences, public schools, colleges and universities, and correctional facilities and preached at numerous churches nationally. She is passionate about delivering relevant messages about Christ, bringing hope, increasing faith, promoting resiliency and efficacy and transforming the lives of people. We are blessed to have her lead us in worship!